He Loves Me. He Loves Me Not. Happy Anti-Valentine's Day! I always get silly around this time of year because I start seeing so many beautiful and romantic makeup looks popping up, and I start thinking of those of us that might loathe the holiday. Maybe you are unattached or heartbroken? Maybe you don't like how over-commercialized Valentine's Day has become? Maybe you are allergic to chocolate, Teddy bears, and love? Hey, I got you, girl. This is for those of us who might not be a fan of Valentine's Day. Nope. No lovely pink shadows, purples, or ROSES. No way. 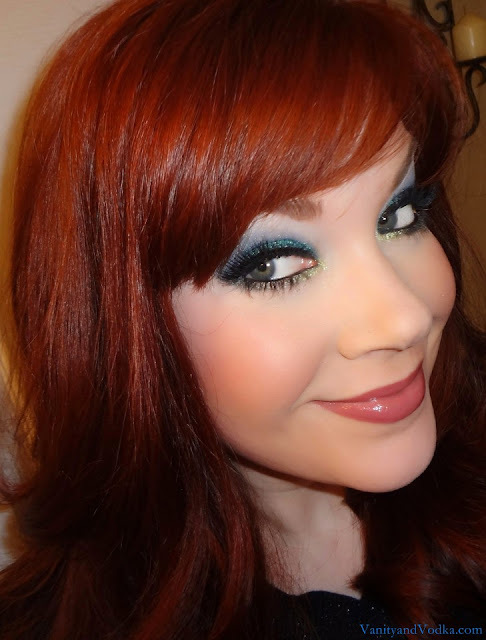 This is, what I like to call my "Anti-Valentine's Day" makeup look for 2013. I'm currently obsessed with this fabulous cruelty free indie brand that I discovered on Etsy a while back, Rose Marie Shadows. 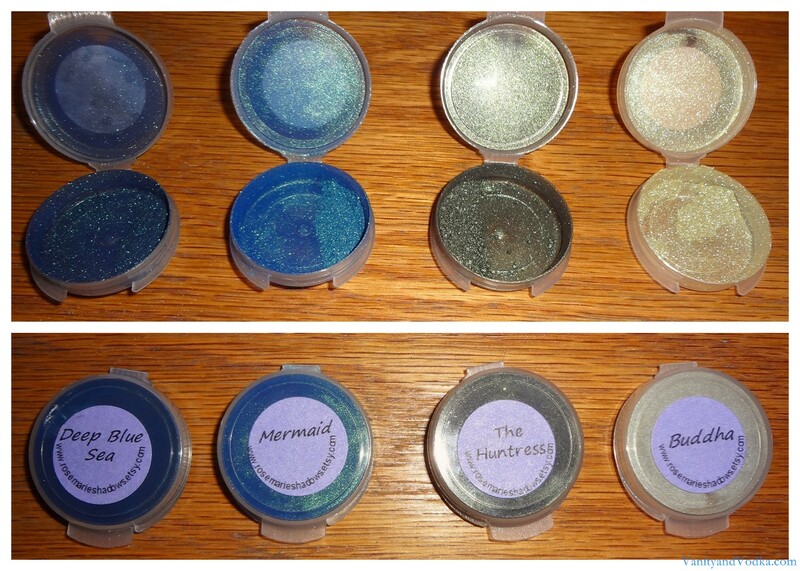 The colors are stunning, highly pigmented, and totally affordable. :-) The colors that I am using for this look are Deep Blue Sea, Mermaid, The Huntress, and Buddha. 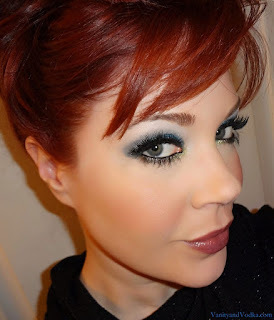 ♥ Rose Marie Shadow in Buddha to inner corner. SO twinkly! NOW... I did say no pinks, right? So why not get go for a black lip, instead? Best wishes to you! I hope you have a wonderful week :-) Thanks again for stopping by! Truly love it when you do! Thank you!! They are beautiful! I'm glad you like it, Kayla! I couldn't resist! I had too much fun! Holy Freaking Moly...I LOVE this look. I love these colors. I'm seriously speechless. I just keep staring at it...sooooo pretty. I especially love "The Huntress," but if I could bottle this entire look and wear it every single day...I think I might just do it. Unbelievable...LOVE!! Happy Valentine's Day to you, by the way. As a serial non-relationship-ette...(Kristi's always been better with relationships...I stay away...;)..)...I very rarely celebrate in any romantic way whatsoever. However...I love hearts and chocolate and basketball...which are what my Valentine's Season are usually comprised of, so it makes me happy anyway. Janine you are hilarious!!! I'm so glad you love it! The shadows are amazing, so I had a blast putting this together! Happy Valentine's Day to you, too!! Hearts, chocolate, and basketball sound like a wonderful way to spend the holiday, so have a great time!! Also, I'm sure we'll find each other on facebook...goofing off as per the usual and that couldn't make me happier! Ha ha!! !Thank you so much, Becky!! ME FLAWLESS?? Girl have you seen your beautiful posts!! Gorgeous!! Beautiful eye look! You are gorgeous! Sooooo gorgeous, I like the pairing of the black lip. Gorgeous look as always, that eyeshadow is wow!!!! Thank you so much, Angela!! :-) YES the shadow is WOW! very pretty look! Eyeshadows are so pigmented. Gorgeous! lol!! Colleen!! This is such an awesome post haha! So entertaining and such beautiful looks! I'm so glad you enjoyed it!! I had a blast with it :-) Thank you Traci!! Hahah you're so funny and your make up looks beautiful! They ARE amazing!! :-) Love em! AMAZING!!! Love the glitter on the lid!!! Thank you, Niki! :-) xoxo! Girl you are so stinkin cute!!! Love the look......goes so well with the fire red hair!! Love you mucho dollface! Erin!!! Love it when you come visit!! Thank you, babe!! Great post! Cool blog- you have a new stalker! Ha! Thank you!! In this case, I don't mind being stalked! lol! Glad you like it!! Thank you! Hi sweetie, new follower here :-D Your makeup is gorgeous, love the colours! Really like your blog and think you would be a great addition to our Aloha Friday Blog Hop. It is a great way to meet other bloggers, get some exposure for your blog and find new readers and followers. Feel free to stop by anytime and join us :-D Happy weekend !